← The last shingles are off! randpa showed up just in time to get in on the fun of picking up the baby chicks from Lee’s Ace Hardware in St. Joe. We raise 100 broilers over the summer every other year to stock our immediate family’s freezers plus a few friends. They are a Cornish Cross Broiler chicken and we raise them in a little chicken coop, starting in just a small corner with heat lamps. They need to be kept in a pretty hot environment, 98 degrees the first few days, and then the temperature can be kept 5 degrees cooler each week. We adjust the temp (you can see the thermometer on the wall), by turning the lights on and off, one or both, and by raising them higher in the air. 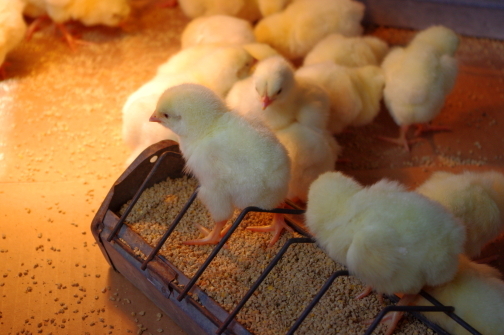 The chicks will tell you if they are too hot or cold by how much they crowd or avoid the heat lamps. We also put cardboard under them for easier clean-up. The chicks start on 22 % protein Medicated Broiler Starter, and after four weeks, they go to 20% protein Medicated Broiler Starter, and after another four weeks they go to 18%. It is recommended you switch them to unmedicated feed one week before you intend to butcher them, but we usually do unmedicated for two weeks. It is also recommended you butcher them at 8 or 9 weeks old, but we usually let them go 11 weeks or so.